Though my wallet doesn’t allow it, I’m still a massive fan of high end fashion, especially accessories such as shoes and bags which I can’t get enough of when window shopping – if only I had the money my wardrobe would be full of so many wonderful brands! One of the designers that has caught my eye recently is Gucci, their latest collections are just so amazingly colourful, fun and eclectic, with endless amounts of contrasting prints and colours. The phrase ‘more is more’ definitely applies here. So when I heard Gucci were unveiling their debut homeware line, Gucci Decor, I couldn’t wait to see what they’d come up with. Described as “an eclectic collection of items with which customers can dress their own spaces.” this collection is everything I’d imagined and more! I was excited to find out that the designs are inspired by Gucci’s current fashion collections – there’s clashing colours, bold prints, and animal head motifs a-plenty. Gucci Decor’s initial launch includes a wide range of home accessories – there are practical and functional items such as chairs, tables and screens, as well as smaller home accessories including candles, cushions and trays. As I’m sure you can imagine, these products won’t come cheap – starting from the bottom end of the scale, a candle will cost £150, up to an eye-watering £23,000 for a printed silk screen, gulp! In all seriousness though, I think these prices are pretty much to be expected, as with any high fashion house that offers home decor, you’re paying for the design, quality of materials and of course the name. Inventum – a delicate note of ancient damask rose, blended with voluptuous and distinctive Taif rose. Fumus – the dark and intense scent of birch, mingled with orange leaves and beeswax. Herbosum – the fresh, intense scents of tomato leaves and aromatic plants, mixed with the fragrance of long grass peppered with basil and lemongrass. Esotericum – the bitter aroma of Seville oranges, intricately intertwined with notes of jasmine, leather and salt. I’m really into scents with orange notes at the moment, so I’m loving the sound of Fumus and Esotericum especially. Hopefully I’ll get to give these a sniff when the range has launched in store. 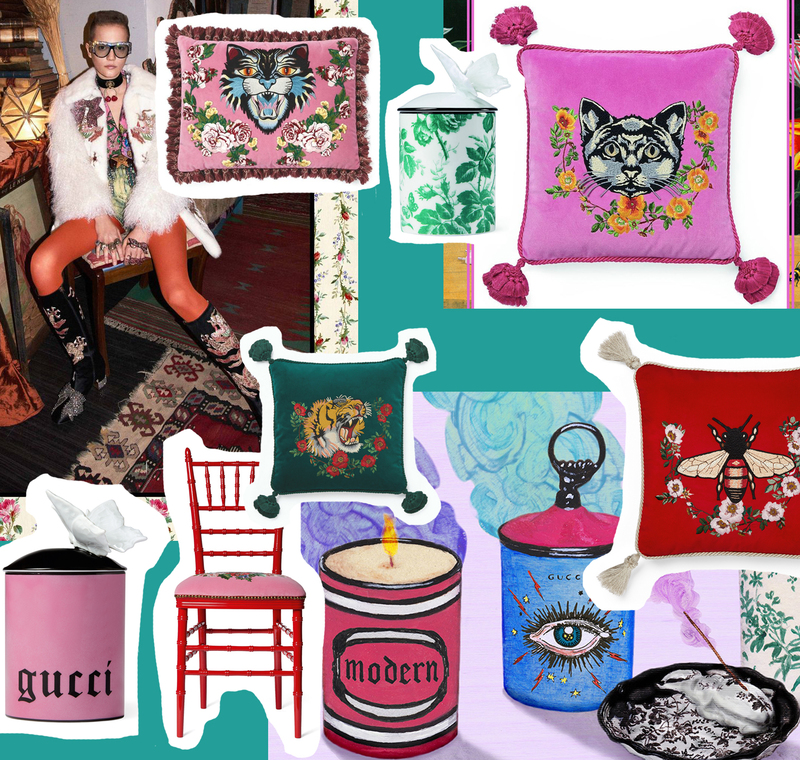 The Gucci Decor collection will be available from September online and in selected stores. Next Post Every Single Beauty Advent Calendar for Christmas 2017!